Pharrell Williams says asking him if he wants to go out partying is like asking a McDonalds worker "if they want chicken nuggets for dinner". Despite being a successful singer, the 41-year-old star insists he's not a big fan of going out and getting drunk and having a dance because he experiences enough entertainment when he is performing to a crowd and throwing plenty of shapes. Speaking to Arabic language magazine Ahlan! in Abu Dhabi, he said: "I’m not the biggest partier. It’s kind of like asking someone from McDonalds would they like some nuggets for dinner, that’s what you do all day." While the 'Happy' hitmaker - who has a six-year-old son Rocket with wife Helen Lasichanh - isn't too bothered about going out partying, he will be having a bash to remember at new year as he has splashed out on an epic set of fireworks ready to see in 2015. He added: "I’ll probably be bringing in the New Year with an unimaginable set of fireworks that’ll be going off. That in itself will be different." 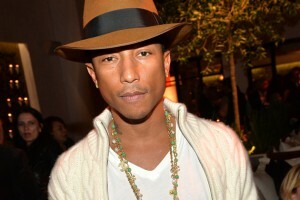 Pharrell is famous for his singing ability, including being the frontman of rock, funk, and hip hop band N.E.R.D, but he is also known for his trademark Vivienne Westwood Buffalo hat, which he wore at this year's Grammy Awards in January, and he cannot believe his headgear is still a big talking point. He said: "I think it’s awesome that we’re still talking about it right now even though I’ve not worn in ages. Who knew? You don’t do things for attention; you do things because of the way you’re feeling in that moment."